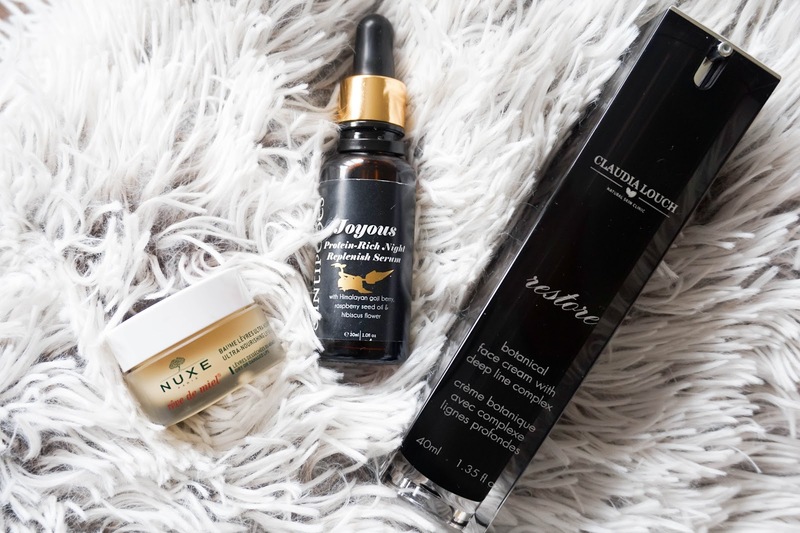 I'll go through each product individually in the same way I do in my regular skincare routine, so you can get an exact idea of how I take care of my skin in the evenings. 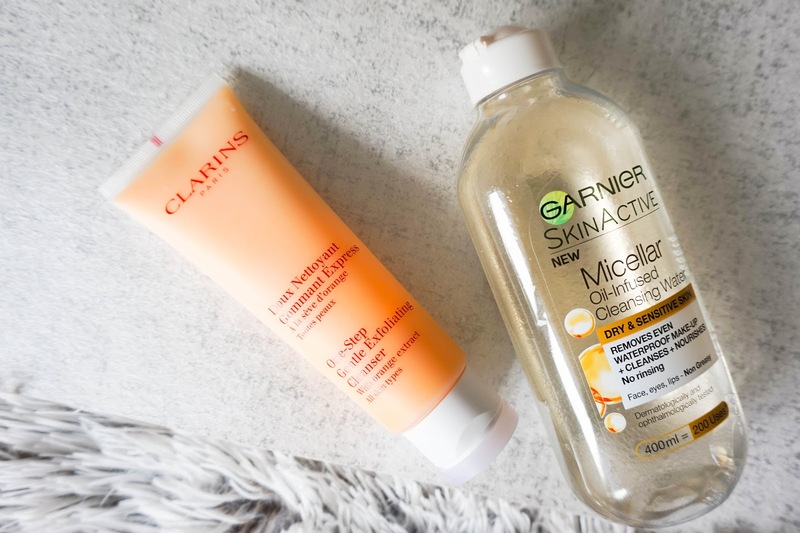 First up I use one of my holygrail products, the Garnier Micellar Water, to remove my eye makeup. I'm currently on my second bottle of their newest Oil-Infused version, which is perfect for my dry skin and removes my eye makeup effortlessly. If I'm wearing waterproof mascara (quite rare for me) then this micellar water isn't really effective... but for my regular mascara and even my dark smokey eye makeup looks, I have no problem at all removing every last trace. I think the key with micellar water is to hold the soaked cotton pads on your eyes for at least 30 seconds (I try to do so for almost a minute), as it really helps to break down the makeup. Once my eye makeup is completely removed I'll even go ahead with another soaked pad to quickly remove the majority of my face makeup too, before using another cleanser. If I'm not wearing makeup, which is quite often for me, then I will just use this micellar water to quickly remove any impurities/dirt added up from thought the day and then simply rinse my face with warm water. 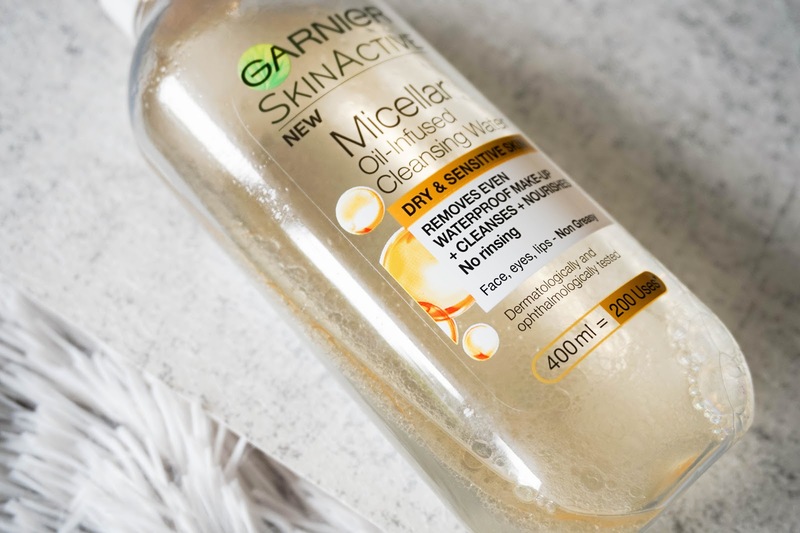 I can't fault this Garnier Micellar Water, been using it for years now and for the price (usually on special offer) it works amazingly well for me. Like I mentioned above if I have been wearing makeup then I will usually double cleanse to make sure every last trace has been removed from my face. So once I get the majority of the makeup off using my trusty micellar water, I go ahead with a cleanser. 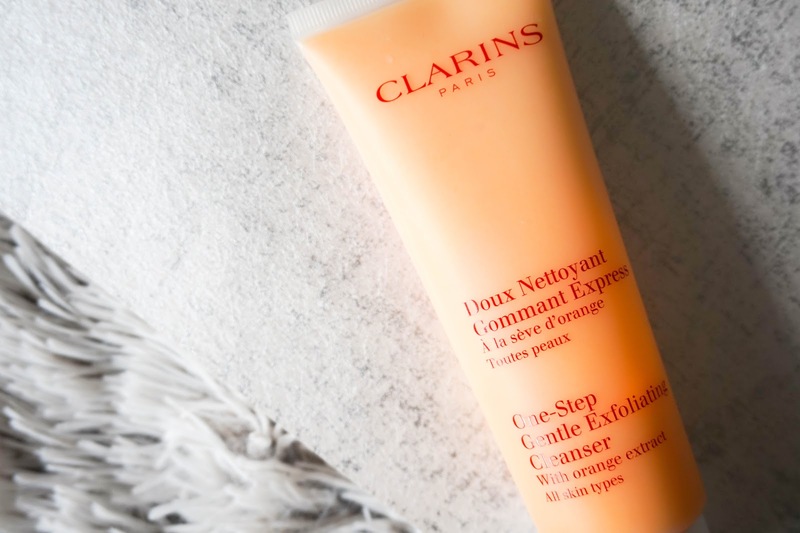 I'm currently testing out this Clarins One-Step Gentle Exfoliation Cleanser*, which I've already reviewed in full here so I'll try not to go into too much detail again. I love the scent of the cleanser and finds that it really does help to remove every last trace of makeup. Despite the name I personally don't think it's gentle enough to be used daily on my dry skin, hence why I only use it on days when I wear makeup (usually between 3/4 days a week). Even though the name is a bit misleading, I am still enjoying it a few times a week and I find that it keeps my skin feeling fresh and radiant. Once my skin is feeling refreshed and cleansed, it's time to keep it feeling hydrated and nourished, which includes my lips also. 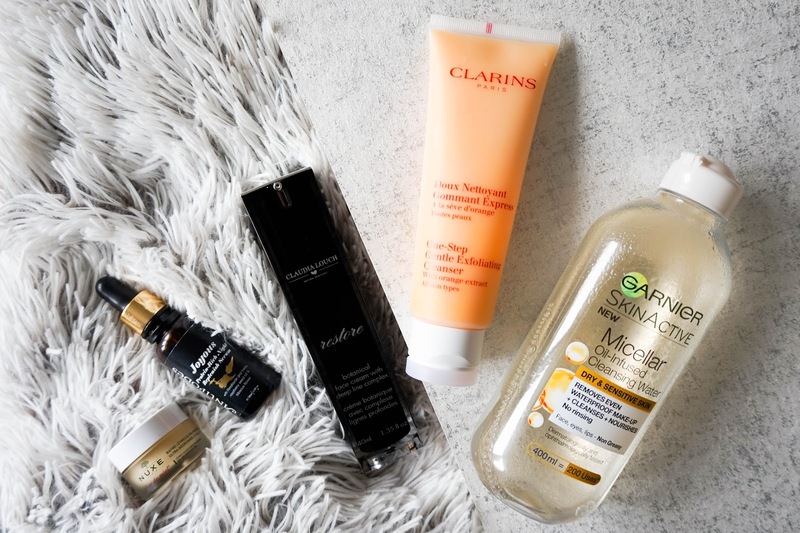 I'm missing an eye cream from this routine because truth be told I'm yet to find one that has really made a difference to my eye area and I do struggle getting into the habit of using it daily. I know I will need to consider changing this and introducing an eye cream sooner rather than later, but for now it's just not something I have gotten into. I've talked about Antipodes Organic Skincare more than once on my blog, it's a brand that I've really come to love and admire. Not only that but it really works for my current skin needs, without causing breakouts or problems. 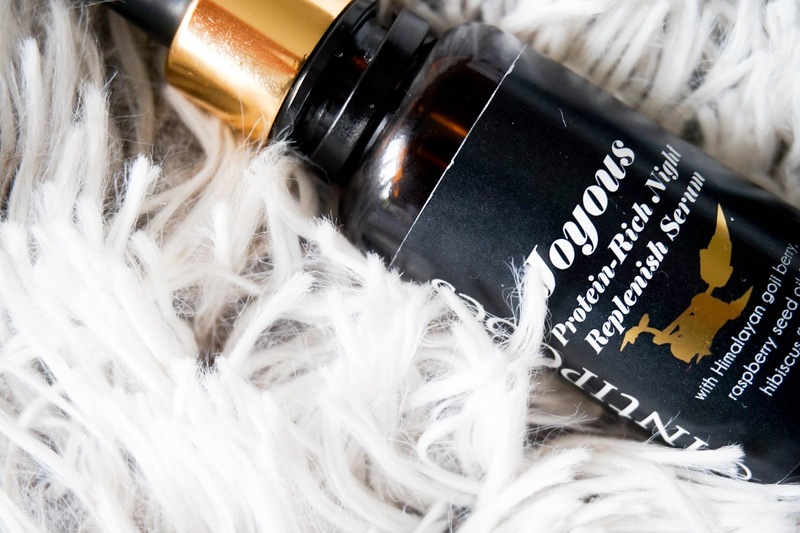 I've been using this Antipodes Joyous Night Replenish Serum* for a good few weeks now an day skin is absolutely loving it. This silky oil feels super smooth and nourishing as soon as I apply it to my skin. I only need 3 - 4 drops to massage it into my skin and it instantly feels moisturised. The main ingredient Himalayan goji berry helps to restore elastin & natural radiance, as well as protecting the skin overall. It has a really pleasant scent and I find that it sinks into my skin completely within 10 to 15 minutes, depending on how dehydrated my skin feels at the time. I have no complaints about this little skincare hero and I already know that I'll be very sad when the bottle comes to an end. Once the face oil has sunk into my skin, I will take it one step further, as I add further hydration using a moisturiser. 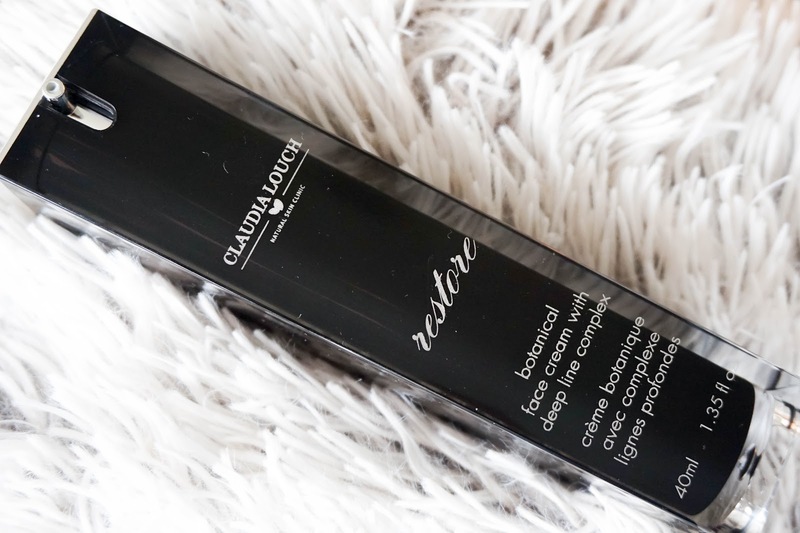 At the moment I'm using this Claudia Louch Restore Botanical Face Cream with Deep Line Complex*, which not only works well as a day cream but feels super luxurious on my skin in the evening too. For my night routine I tend to use 2 pumps and in the morning I usually use 3 - 4 pumps to make sure my skin is well prepped for the day ahead. The cream has a rich texture but doesn't leave my skin feeling greasy, so it's nourishing without that heavy feeling. The anti-ageing properties come through from the super active grape seed oil ingredient... which not only helps to tighten and tone, but also hydrates and soothes the skin whilst providing antioxidants. I've only be using the cream for over 2 weeks now, so I can't confirm that it helps with anti ageing, but my skin is feeling great overall as it looks plumped with a healthy glow. Lastly I will finish my skincare routine with a good dose of lip balm since I suffer from dry lips on a regular basis. 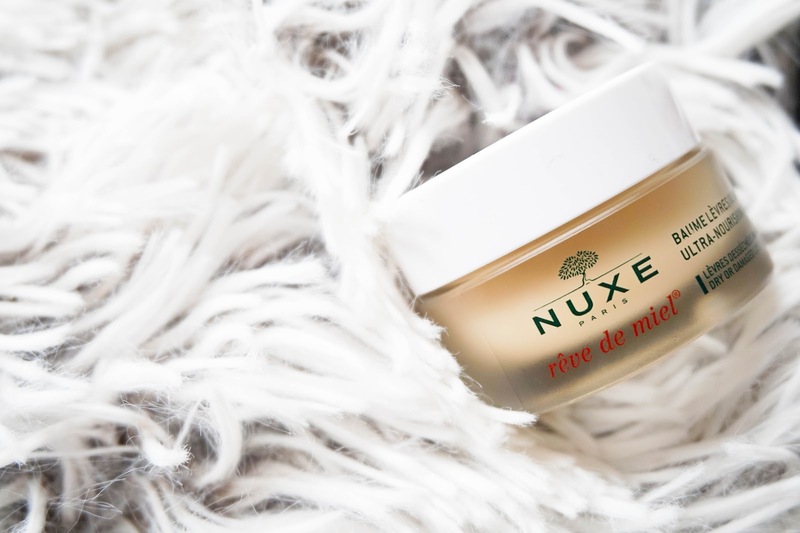 I have been loving the Nuxe Reve De Miel Ultra Nourishing Lip Balm for a good few months and yes it really does deserve all the praise & hype it gets. It's a bit pricier than most lip balms and it took me a while to splurge on it, but now I can see that it's totally worth the money. The texture is super rich, focusing on repairing & protecting dry, chapped lips. The blend of honey, plant oils & shea butter instantly adds comfort to the lips. I love using this at night because I wake up to super soft & nourished lips.